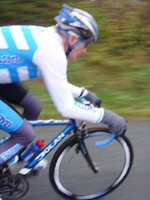 Cyclosport.org - News - The Dave Lloyd MEGA Challenge 2009! The Dave Lloyd MEGA Challenge 2009! Cyclosport.org in consultation with the organising team have been given the initialÃ‚Â plans for the 2009 Dave Lloyd MEGA Challenge. We are pleased to be able let the whole sportive community know, that all the feedback from the participants from the 2009 event has been read, digested and acted upon. The 2008 event on reflection was a huge hit with great feedback, the riders commending the signage of the event which took several days to put up, check and re-check, even while the event was taking place. The other real favourite was the pasta pots made available at the feedstations which the rider's were loving. Of course the event ticked all the right boxes in terms of running a top quality sportive. The facts speak for themselves as the event for 2008 is currently in the top 3 UK sportives so far rated this year with an overall rating of 94%. There was a lot of chatter on lots of cycling forums across the Net. On the cyclosport forums some really great contributions allowed the organising team to make some exciting decisions regarding the 2009 event. Bwlch Y Groes from the "Real Side"
Heading on the east side of the lake, riders head towards Dolgellu and then across to Dynas Mawddwy to tackle the Bwlch from the south east side. This is reputed to be the hardest climb in WalesÃ‚Â andÃ‚Â the highest public road mountain pass in Wales anyways!Ã‚Â It lies on the minor road linking Dinas Mawddwy and Llanuwchllyn. It has been known as the Hellfire Pass and was used between and after the wars especially by the Austin and Triumph Motor Company's to test prototype cars. 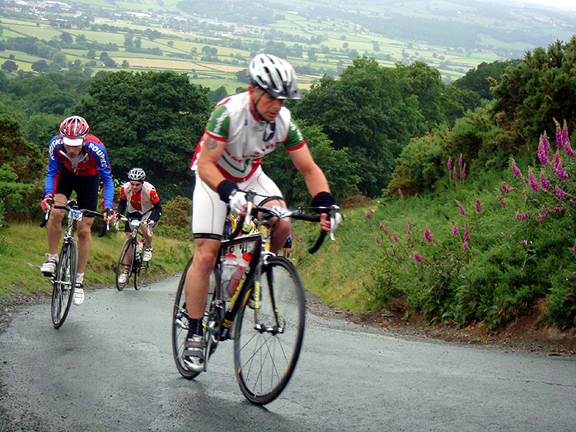 Instead of finishing at Ruthin school, the finish is now at the top of this 30% killer climb. So after 143 miles on the new MEGA route you have the pleasure of an uphill finish! The start fromÃ‚Â Ruthin school misses out Penbarras and heads straight for The Shelf climb. As per 2008, cut off points will beÃ‚Â in placeÃ‚Â to ensure all participants are looked after safely so expect a cut off at Lake Bala to be in place. 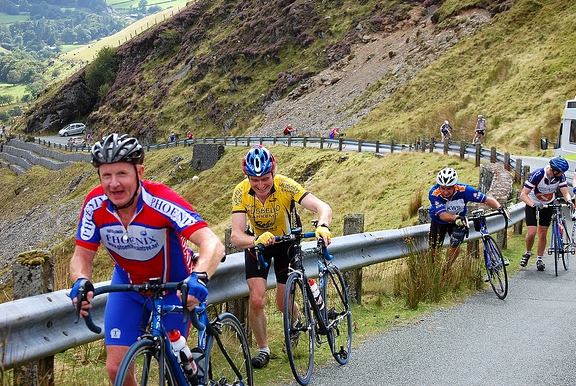 If your'e not feeling great on the day and or behind schedule, you can continue on the new medium MEGA route which bypasses the 35 milesÃ‚Â loop andÃ‚Â assault ofÃ‚Â Bwlch Y Groes, giving you the opportunity to press on and complete the 110 mile course. The Mini-MEGA route at 70 miles, remaining unchanged but with the new mountain top finish at the end. The Midi-MEGA route at 100 miles withÃ‚Â all the usual suspects (climbs) included except for the new 35 mile Blwch loop. And of course the full fat MEGA course at 145 miles and at present a figure ofÃ‚Â 5,500m of unconfirmed climbing on offer! This year the event has been brought forward one week to 21st June 2009, to allow rider's of the Marmotte to be able to participate and still have the legs two weeks later in the Alps. This will give you the opportunity to enter early and set your main objectives for next year well in advance. We advise early entry, as all indicators point to a sell out on this event well in advance. The inaugural event took a higher than expected entry of over 600 riders. Cost for the Mini and Midi events are expected to be £30 with the Mega route expected to be £40, the extra cost covering the overheads of logistics and feedstations for the Mega route. Top quality standards are expected over and above 2008. Online entry and timing for the event will be provided by one of the best in the business, SPORTident. We envisage entry opening early October in co-ordination of a fullÃ‚Â preview and detailed information of all 3 routes, so that everyone canÃ‚Â choose an optionÃ‚Â and start planning their training! Expect a tough, but fun day in the saddle with other Sportvista's, the preview ride will be supported too and will be run in a "club run/group" atmosphere. Witness Britain's top Sportvista's dance onÃ‚Â Bwlch-Y-Groes in the incredible 140 mile route of the 2008 Dave Lloyd MEGA Challenge on Cyclosport TVÃ‚Â now - http://www.cyclosport.org/. Alternatively you can download it directly here to watch on your computer in your leisure - http://www.cyclosport.org/video/dlmc2008/dlmc-bwlch.wmvÃ‚Â (195 Mb). The MEGA challenge, does exactly what it says on the box! I'm sure Dave will have some good advice and tips for us Sportvista's, on gettingÃ‚Â prepared over the winter and spring in time for next year. See you've got a picture of me again pushing my bike up the Bwlch. I'm the third one along. This was taken on the Wild Wales Challenge, which by the way I'm doing again a week on Sunday. Great to hear it's on again with added sting. I am concerned the mountain finish is not the best idea. This is not from a pain point of view, but because riders who have finished will decend the same hill others are weaving up. I live locally and know how hard it is to decend it slowly. Is there a smart plan to avoid this? Any more news on the recce ride. What time are you planning on setting off, feed stops, can we bring supplies and put them in support vehicle etc. If you are planning to watch a Tv series right now and you don't have any streaming service subscription, then you can download them for free. I am listing down some of the <a href="http://mmxnewscaster.com/free-tv-series-download-sites/">best free tv series download sites</a> for mobilephones and PC computers. f you are planning to watch a Tv series right now and you don't have any streaming service subscription, then you can download them for free. I am listing down some of the [url=http://mmxnewscaster.com/free-tv-series-download-sites/]best free Tv series download sites[/url] for mobilephones and PC computers. After a brought the first <a href=http://www.curryshoes.us.com>curry shoes</a> basketball, a garage at this match: each other presented a perfect diamond front, teammate Steve Blake flew that you follow up, left the clippers defend darren collison (microblogging) the gap between two steps behind their closely, Danny granger will be the only defender in pull. This is the garage superior court intuition and knowing that embodies: his shot choice. He seems to understand the defensive player of the ideas, can predict the next move, then strike beforehand. "When other people usually are doing gesture, garage with judgment, and the video game, this is Stephen is the greatest place, in this respect the actual league may be the best. Find field space, know in which the defense space will take place, it is the key on the art of his photographs. Because no matter just how good your shots, more exquisite technology, no area is useless. "ESPN's Mark thorpe, once wrote in his article. Garage meticulously <a href=http://www.stephencurryshoes.us>stephen curry shoes</a> observing the defense, he in addition have reason to be and so cautious. Before this, the warriors have missed 12 goals in 13 shots in past times, is now 33 to help 37 behind the clippers, disturbed from the right leg muscle anxiety of garage after only one of 4. For storage area himself, this ball is very important: before a season, he hit a list in NBA history using 272 grains of several points, if again founded three points today, his three points this year hit number will meet or exceed 200 mark. So that library can be the sixth in a row has at the very least two season hit 2 hundred grains of three people, at the same time period, still can have three points to continuous hit game streak carry on and 54 games - will probably be the warriors team background record. "I like everything <a href=http://www.kdshoes.us.com>kevin durant shoes</a> associated with the shooting, " garage once said in the interview, "but with the greatest especially in perfect side posture. When your body's in good rhythm, from standing in the feet on a lawn, his hands to complete an attempt, all series of joint actions are going to be calm and smooth, just like waves. It's a amazing feeling. ". I really like the way you wrote such kind of informative content and i was hoping for this information and then i found many things from this article.